The traditional Mediterranean diet dates back to ancient times (5000-2000 BC) when the key defining ingredients were the trio of wheat, wine and olive oil, as well as wild edible leafy greens and legumes. In more recent times, this dietary pattern has come to include a broad range of colourful fruits and vegetables including citrus fruits, tomatoes, chillies, eggplants, and potatoes which were introduced from South America to Europe in the 1500s by explorers such as Christopher Columbus. The traditional Archetypal Cretan Mediterranean diet was first described in the scientific literature by Ancel Keys and co-workers who investigated the link between diet and lifestyle behaviours and death from heart disease and all causes in the 7 countries study1 – the researchers found that the group from Crete had almost no deaths from heart disease after 15 years of follow-up which this was linked to their plant-based olive oil rich diet. The traditional Mediterranean diet is now the most researched dietary pattern worldwide and a recent ‘umbrella’ review of 13 meta-analyses of observational studies and 16 meta-analyses of randomised controlled trials investigating the link between adherence to a Mediterranean diet and 37 different health outcomes (covering more than 12.8 million people), has shown that adherence to a Mediterranean diet is protective against deaths from all causes, and from heart disease and stroke, diabetes, some cancers, neurodegenerative diseases and Alzheimer’s and other dementias2 (ref). The Mediterranean dietary pattern was recently awarded the best diet of 2019 by the US News and World Report3. The review analysed 41 different diets and found the Mediterranean diet was the best diet for healthy eating, also emerging as the best plant-based diet, best diet for diabetes and easiest diet to follow. Can we all benefit from the Mediterranean diet? One major critique of the many Mediterranean diet studies to date, is that the majority of evidence in support of the Mediterranean diet in the prevention and management of chronic diseases comes from studies in the Mediterranean where people are already consuming a mostly Mediterranean-type diet. There is a perception that this diet won’t be easy for other populations outside the Mediterranean region to follow. However in Australia, research teams have investigated the impact of a traditional Mediterranean diet in patients with fatty liver, diabetes, heart disease, asthma, depression and anxiety (refs) and have shown good adherence to this highly palatable dietary pattern and positive health outcomes. In a recent pilot study of the Australian Mediterranean Diet Intervention in Secondary Prevention of Myocardial Infarction (AUSMED) Trial led by Dr Hannah Mayr (APD PhD),the impact of a Mediterranean diet was compared with a low-fat diet on classic and novel CVD risk factors following 6 months of dietary intervention5. 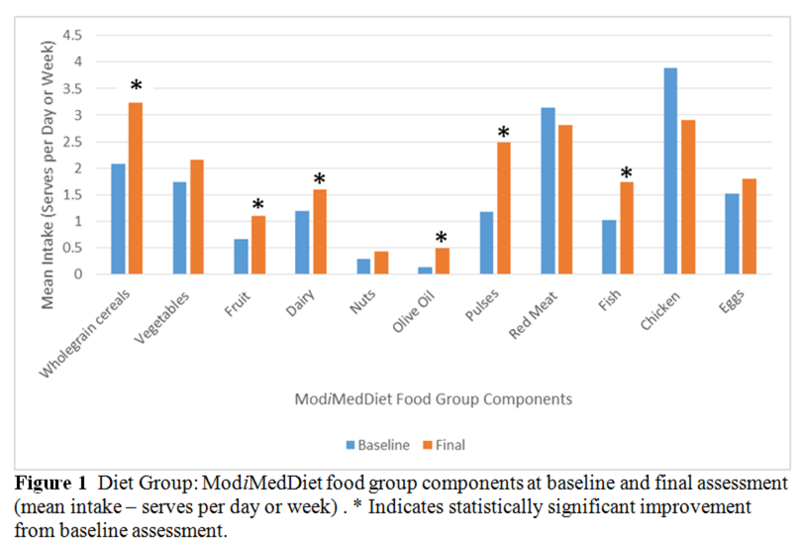 The outcome was positive, showing that participants on the Mediterranean diet achieved high adherence to the Mediterranean diet at 6 months as highlighted below. Participants improved their intake of whole grain cereals, fresh fruit, dairy (especially yoghurt), extra virgin olive oil, legumes, and fish. However, those following a low-fat diet didn’t significantly change their diets, which indicates that a low-fat diet is more difficult to follow than a Mediterranean diet. So how can we all enjoy a more Mediterranean diet? The following 10 steps include the key foods and ingredients of a Mediterranean diet that can easily be incorporated into any eating style. So why not give the Mediterranean diet a go! It’s easier than you think – these deliciously easy Stuffed Capsicums need minimal prep or try this filling Chickpea & Spinach Soup from Professor Catherine Itsiopoulos. Take a look at our recipe section here for more inspiration.